We as humans tend to adapt our personalities when in different situations. When with friends, we typically amp up the fun. When around our family, we tend to adhere to the rules we grew up with. 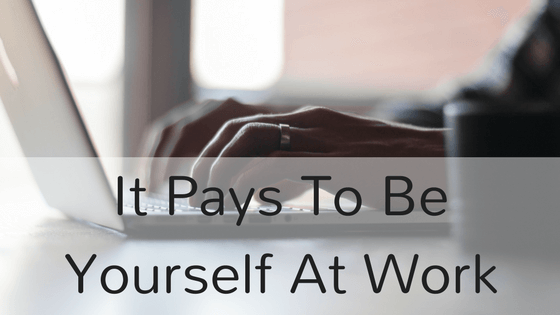 Likewise, at work many of us will portray ourselves as productive, hardworking, and reserved. Although we are all truly these various versions, it may pay to be your true self at work — the one you are when you are alone. One thing many people do in a work or school environment is try too hard. They usually want recognition from their higher-ups that they are doing a good job. Unfortunately, this can reveal itself to both our bosses and our coworkers, and we could gain a reputation of being a kiss-up or trying to bring other people down. While it is important to complete your work efficiently, it can become a problem if you brag about your accomplishments. Your true self outside of work may not be this way, so consider honing in on that non-work-related attitude every once in awhile. People who work in low-paying jobs tend to have less to be happy for at work. They may feel they deserve more compensation, or they may become frustrated if they perceive management as overworking them. Rather than come in to work every day with a negative attitude, try taking some of the positive energy you have in other areas of life. Sure, some of us may be more negative in general, but most of us have something to be happy about and hopeful for. Use that feeling to get excited for the work day. In our personal lives, we have times where we are not friendly toward everyone. Yet, on most days, we are at the very least polite to everyone we encounter. At work, try to socialize a bit with your coworkers or bosses. You may have a different perspective on the people you work with after taking some time to get to know them. Plus, this is a great way to show you are invested in the company, rather than staying there merely to make a paycheck. In some environments, there may be little room to stand out as an individual. However, doing so could get you recognition, or even a promotion. Consider what hobbies and activities you like to pursue in your spare time, and think of any ways you could incorporate them into the business. If you pitch an idea that becomes successful, you will always stand out as the person who took initiative, which looks good for yearly reviews. Although you may feel like you need to be a certain version of yourself at work, I encourage you to challenge that notion. There are plenty of characteristics we tend to leave at home that can be effective at work. Think of how you can bring your personality into the office and try utilizing those aspects.